9 year old female with history of acute lymphocytic leukemia (ALL), status post heart transplant 9 months ago for chemotherapy related cardiomyopathy, presented to the emergency department with 4 weeks of worsening neck pain and 2 days of dysphagia and voice changes. She stopped moving her neck, refuses solids, but is able to drink liquids. She has been afebrile. She has been seen twice by other providers over the last month, was diagnosed with torticollis, and given diazepam and acetaminophen with codeine without improvement. Home medications included tacrolimus, mycophenolate and prednisone. On physical examination, the patient had a pulse of 133 beats/minute, blood pressure of 100/67 mmHg, temperature of 36.9 °C, respiratory rate of 22 breaths/min, and oxygen saturation of 98% on room air. The patient was sitting in a tripod position with her chin forward and was drooling. She refused to move her neck and had a muffled voice. No lymphadenopathy was appreciated. Oropharyngeal exam is shown. 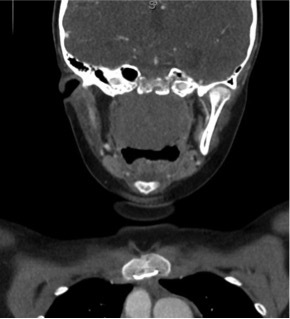 The differential diagnosis included recurrent ALL, lymphoma, rhabdomyosarcoma, nasopharyngeal carcinoma, post-transplant lymphoproliferative disease (PTLD), epiglottitis, bacterial pharyngitis, tonsillar abscess, or para/retropharyngeal abscess. The patient had computed tomography (shown). She was intubated in the operating room for airway protection. Biopsies confirmed Epstein-Barr virus (EBV) positive, PTLD with diffuse large B cell lymphoma. PTLD is a potentially fatal complication of transplantation. Presentation depends on the type of PTLD and the areas involved. Symptoms include fever, weight loss, lymphadenopathy, and dysfunction of involved or surrounding structures. It is caused by lymphoid or plasmacytic cell growth in the setting of chronic immunosuppression, often after solid organ or allogeneic hematopoietic cell transplantation. Most cases are related to the presence of EBV. The incidence of PTLD is 1% in the transplant population and is seen more frequently in recipients of heart, lung or multi-organ transplants. Previous PostSecond Place EMages Winner 2015: It’s All in the EyesNext PostElectronic health records (EHRs): Are they good for emergency department providers and for throughput?